Sac State junior guard Tiara Scott defends Idaho State freshman guard Callie Bourne in a 56-42 loss to the Bengals on Jan. 31. Scott finished with 10 points, 4 assists and 4 steals. 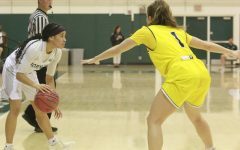 Coming off their first true road win of the season, the Sacramento State women’s basketball team lost 56-42 in their return home to the Nest Thursday against the Idaho State Bengals. 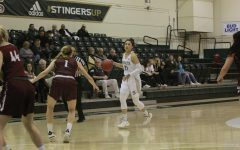 The Hornets (7-10, 3-6 Big Sky) played two road games last week against the Idaho Vandals and Eastern Washington Eagles, going 1-1 on the trip. 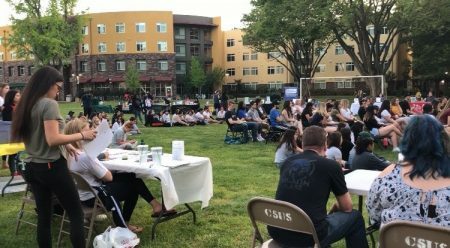 In the first game, Idaho dominated Sac State 104-66. Junior guard Kennedy Nicholas was the one bright spot in the game as she had her third consecutive double-double with 18 points and 19 rebounds (8 offensive). The team then traveled to Cheney, Washington to take on the Eagles. Sac State got their first true road win of the season with a narrow 73-70 victory. Junior guard Hannah Friend and Nicholas each had a team-high 17 points. Nicholas also added 10 rebounds to notch her fourth consecutive double-double. 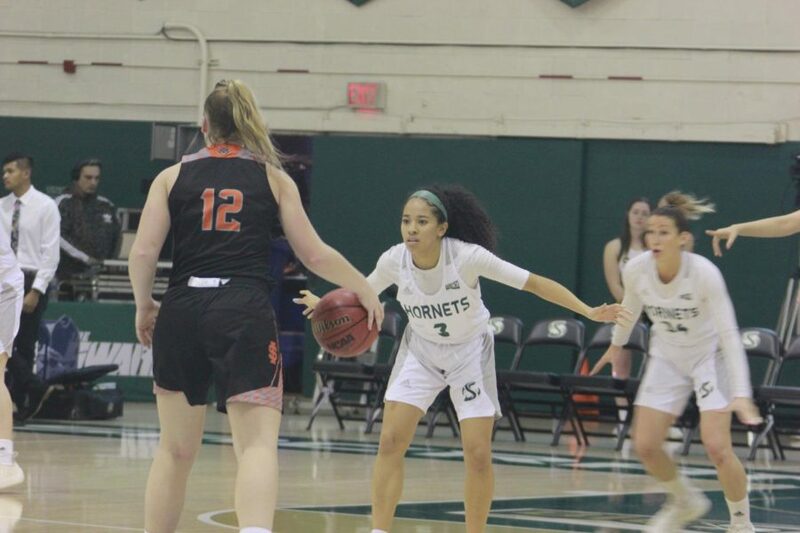 Sac State came into Thursday’s game seeking retribution against the Bengals (13-6, 8-2 Big Sky) as Idaho State dominated them 73-43 in their last matchup on Jan. 12 in Idaho. Unlike in the last home game against Southern Utah which was very back and forth, Idaho State controlled the entire game. The lead changed twice as the Bengals led for 39:08 of the 40 minute contest and ultimately won by 14 points. Sac State’s single-quarter woes resurfaced once again, this time in the second quarter. Idaho State outscored the Hornets 22-4 in the second period as the team shot 2-12 from the field. “In the second quarter, we really got into a pattern of shooting the ball really quick into the possession and we weren’t playing good defense,” said senior guard Raegen Rohn. “They went on a big run and we had a hard time stopping it. One bad quarter has been the constant theme in most of the Hornets’ 10 losses this year. The Hornets struggled to make a basket throughout the game as they shot 14-59 (23.7 percent). The Bengals on the other hand were much more efficient shooting 19-42 (45.2 percent) from the field. Idaho State had great ball-movement throughout the game to find the best shot available and it showed on the stat sheet as they had 10 more assists than Sac State (18-8). The Hornets were led in scoring once again by Friend who had 13 points on 5-10 from the field and 10 rebounds. Scott added 10 points with 4 assists and 4 steals. Nicholas scored 8 points with 12 rebounds (7 offensive) falling one field goal short of achieving her fifth consecutive double-double. The Bengals were led to the win by redshirt-senior forward Grace Kenyon who had a game-high 17 points on 7-13 from the field, 8 rebounds and 7 assists. Despite the loss, Harkleroad felt his team improved in the game. Sac State will look to get back in the win-column Saturday at home in their next game against the struggling Weber State Wildcats (4-16, 1-9 Big Sky) at 2 p.m.